Russia’s Gazprom has confirmed its receiving another advance payment of $32 million from Naftogaz of Ukraine for May gas supplies. It’s Ukraine’s third installment this month, and brings the total paid in May to $102 million. “We received the money on Friday,” a spokesperson for Gazprom told RIA on Monday. On Friday Naftogaz said it had paid Gazprom $32 million on May 14. The Ukrainian pipeline operator Ukrtransgaz says the country has bought about 340 million cubic meters of gas this month. At the current price it is estimated to have cost about $84 million. Since the beginning of May, Kiev has paid $102 million to Gazprom in three installments. The $32 million announced Monday and $30 million last week, as well as $40 million paid on May 5. Ukraine sees no need to pay larger sums for gas, as consumption has decreased, Energy Minister Vladimir Demchishin said in March. However, Naftogaz Chairman Andrey Kobolev told Ukrainian television in February the company has been on the brink of bankruptcy since 2009. Naftogaz owes Gazprom $2.471 billion including penalties, Russian Energy Minister Alexander Novak said in April. The additional financing needed to recapitalize Naftogaz brought Ukraine’s overall consolidated fiscal deficit (including Naftogaz) to 10.1 percent of GDP in 2014, said the World Bank at the end of April. 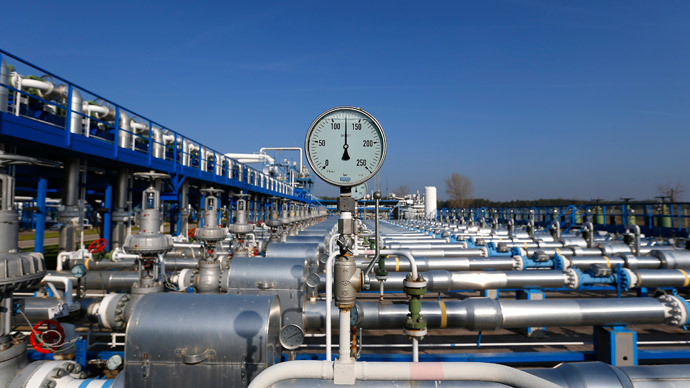 On April 1 Gazprom and Naftogaz signed an agreement on gas supplies for the second quarter of 2015, known as the ‘summer package’. It replaced a similar ‘winter package' signed at the end of October, 2014. Deliveries are made on prepayment terms. Naftogaz now pays Gazprom $247.18 per one thousand cubic meters of gas which includes a $100 discount. The price was agreed after Kiev accused Moscow of pricing its gas unfairly high. In February, Ukrainian Prime Minister Arseny Yatsenyuk told Ukrainian TV that the country was “able to get rid of Russian gas dependence.” In May, Naftogaz doubled its imports from Gazprom as gas supplies from Europe halved after Hungary and Poland suspended deliveries, said Gazprom CEO Aleksey Miller.